The foods we eat contain nutrients. Nutrients are substances required by the body to perform its basic functions. Nutrients must be obtained from our diet, since the human body does not synthesize or produce them. Nutrients have one or more of three basic functions: they provide energy, contribute to body structure, and/or regulate chemical processes in the body. These basic functions allow us to detect and respond to environmental surroundings, move, excrete wastes, respire (breathe), grow, and reproduce. There are six classes of nutrients required for the body to function and maintain overall health. 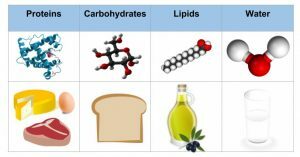 These are carbohydrates, lipids, proteins, water, vitamins, and minerals. Foods also contain non-nutrients that may be harmful (such as natural toxins common in plant foods and additives like some dyes and preservatives) or beneficial (such as antioxidants). Nutrients that are needed in large amounts are called macronutrients. There are three classes of macronutrients: carbohydrates, lipids, and proteins. These can be metabolically processed into cellular energy. The energy from macronutrients comes from their chemical bonds. This chemical energy is converted into cellular energy that is then utilized to perform work, allowing our bodies to conduct their basic functions. A unit of measurement of food energy is the calorie. On nutrition food labels the amount given for “calories” is actually equivalent to each calorie multiplied by one thousand. A kilocalorie (one thousand calories, denoted with a small “c”) is synonymous with the “Calorie” (with a capital “C”) on nutrition food labels. Water is also a macronutrient in the sense that you require a large amount of it, but unlike the other macronutrients, it does not yield calories. Carbohydrates are molecules composed of carbon, hydrogen, and oxygen. The major food sources of carbohydrates are grains, milk, fruits, and starchy vegetables, like potatoes. Non-starchy vegetables also contain carbohydrates, but in lesser quantities. Carbohydrates are broadly classified into two forms based on their chemical structure: simple carbohydrates, often called simple sugars; and complex carbohydrates. Simple carbohydrates consist of one or two basic units. Examples of simple sugars include sucrose, the type of sugar you would have in a bowl on the breakfast table, and glucose, the type of sugar that circulates in your blood. Complex carbohydrates are long chains of simple sugars that can be unbranched or branched. During digestion, the body breaks down digestible complex carbohydrates to simple sugars, mostly glucose. Glucose is then transported to all our cells where it is stored, used to make energy, or used to build macromolecules. Fiber is also a complex carbohydrate, but it cannot be broken down by digestive enzymes in the human intestine. As a result, it passes through the digestive tract undigested unless the bacteria that inhabit the colon or large intestine break it down. One gram of digestible carbohydrates yields four kilocalories of energy for the cells in the body to perform work. In addition to providing energy and serving as building blocks for bigger macromolecules, carbohydrates are essential for proper functioning of the nervous system, heart, and kidneys. As mentioned, glucose can be stored in the body for future use. In humans, the storage molecule of carbohydrates is called glycogen, and in plants, it is known as starch. Glycogen and starch are complex carbohydrates. Lipids are also a family of molecules composed of carbon, hydrogen, and oxygen, but unlike carbohydrates, they are insoluble in water. Lipids are found predominantly in butter, oils, meats, dairy products, nuts, and seeds, and in many processed foods. The three main types of lipids are triglycerides (triacylglycerols), phospholipids, and sterols. The main job of lipids is to provide or store energy. Lipids provide more energy per gram than carbohydrates (nine kilocalories per gram of lipids versus four kilocalories per gram of carbohydrates). In addition to energy storage, lipids serve as a major component of cell membranes, surround and protect organs (in fat-storing tissues), provide insulation to aid in temperature regulation, and regulate many other functions in the body. Proteins are macromolecules composed of chains of subunits called amino acids. Amino acids are simple subunits composed of carbon, oxygen, hydrogen, and nitrogen. Food sources of proteins include meats, dairy products, seafood, and a variety of different plant-based foods, most notably soy. The word protein comes from a Greek word meaning “of primary importance,” which is an apt description of these macronutrients; they are also known colloquially as the “workhorses” of life. Proteins provide four kilocalories of energy per gram; however providing energy is not protein’s most important function. Proteins provide structure to bones, muscles and skin, and play a role in conducting most of the chemical reactions that take place in the body. Scientists estimate that greater than one-hundred thousand different proteins exist within the human body. The genetic codes in DNA are basically protein recipes that determine the order in which 20 different amino acids are bound together to make thousands of specific proteins. There is one other nutrient that we must have in large quantities: water. Water does not contain carbon, but is composed of two hydrogens and one oxygen per molecule of water. More than 60 percent of your total body weight is water. Without it, nothing could be transported in or out of the body, chemical reactions would not occur, organs would not be cushioned, and body temperature would fluctuate widely. On average, an adult consumes just over two liters of water per day from food and drink combined. Since water is so critical for life’s basic processes, the amount of water input and output is supremely important, a topic we will explore in detail in Chapter 4. Micronutrients are nutrients required by the body in lesser amounts, but are still essential for carrying out bodily functions. Micronutrients include all the essential minerals and vitamins. There are sixteen essential minerals and thirteen vitamins (See Table 1.1 “Minerals and Their Major Functions” and Table 1.2 “Vitamins and Their Major Functions” for a complete list and their major functions). In contrast to carbohydrates, lipids, and proteins, micronutrients are not sources of energy (calories), but they assist in the process as cofactors or components of enzymes (i.e., coenzymes). Enzymes are proteins that catalyze chemical reactions in the body and are involved in all aspects of body functions from producing energy, to digesting nutrients, to building macromolecules. Micronutrients play many essential roles in the body. Minerals are solid inorganic substances that form crystals and are classified depending on how much of them we need. Trace minerals, such as molybdenum, selenium, zinc, iron, and iodine, are only required in a few milligrams or less. Macrominerals, such as calcium, magnesium, potassium, sodium, and phosphorus, are required in hundreds of milligrams. Many minerals are critical for enzyme function, others are used to maintain fluid balance, build bone tissue, synthesize hormones, transmit nerve impulses, contract and relax muscles, and protect against harmful free radicals in the body that can cause health problems such as cancer. The thirteen vitamins are categorized as either water-soluble or fat-soluble. The water-soluble vitamins are vitamin C and all the B vitamins, which include thiamine, riboflavin, niacin, pantothenic acid, pyridoxine, biotin, folate and cobalamin. The fat-soluble vitamins are A, D, E, and K. Vitamins are required to perform many functions in the body such as making red blood cells, synthesizing bone tissue, and playing a role in normal vision, nervous system function, and immune system function. Vitamin deficiencies can cause severe health problems and even death. For example, a deficiency in niacin causes a disease called pellagra, which was common in the early twentieth century in some parts of America. The common signs and symptoms of pellagra are known as the “4D’s—diarrhea, dermatitis, dementia, and death.” Until scientists found out that better diets relieved the signs and symptoms of pellagra, many people with the disease ended up hospitalized in insane asylums awaiting death. 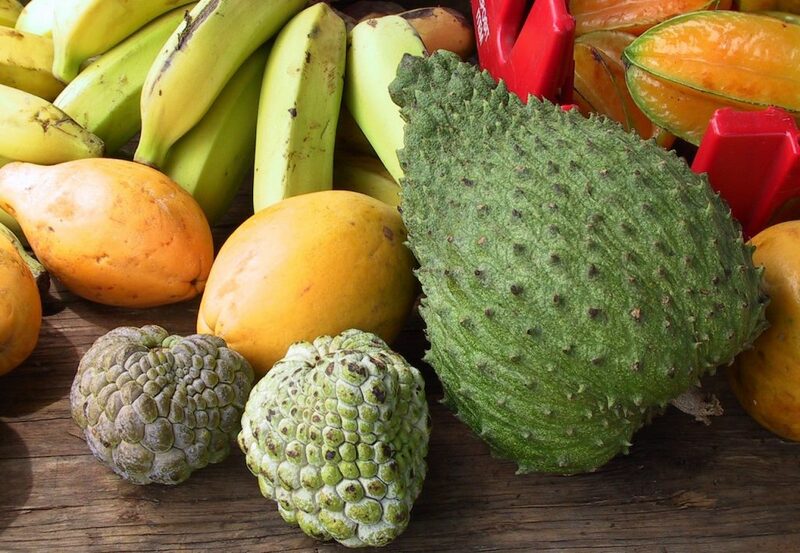 Other vitamins were also found to prevent certain disorders and diseases such as scurvy (vitamin C), night blindness (vitamin A), and rickets (vitamin D). Protein Necessary for tissue formation, cell reparation, and hormone and enzyme production. It is essential for building strong muscles and a healthy immune system. Carbohydrates Provide a ready source of energy for the body and provide structural constituents for the formation of cells. Fat Provides stored energy for the body, functions as structural components of cells and also as signaling molecules for proper cellular communication. It provides insulation to vital organs and works to maintain body temperature. Vitamins Regulate body processes and promote normal body-system functions. Minerals Regulate body processes, are necessary for proper cellular function, and comprise body tissue. Water Transports essential nutrients to all body parts, transports waste products for disposal, and aids with body temperature maintenance.